Sam is the senior partner and lead trial attorney for Johnson & Monteleone, L.L.P. 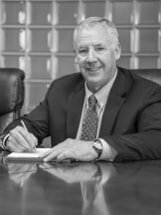 He focuses his law practice in the areas of personal injury, employment law, civil litigation, commercial/contractual disputes, and workers' compensation. Sam has won favorable verdicts in the area of personal injury, insurance bad-faith, employment, and defamation suits since trying his first civil case in 2001. For his achievements, Sam has received a Lifetime Charter Membership in Rue Ratings' Best Attorneys of America, has been recognized as a litigation star in multiple editions of Benchmark Plaintiff, the Guide to America’s Leading Plaintiff Firms and Attorneys, has been recognized by the National Trial Lawyers as a TOP 100 TRIAL LAWYER for 2013 and 2014, and has been recommended and profiled in the Global Professional Network for professionalism in his areas of practice. Sam is admitted to the U.S. Court of Appeals, Third, Fourth and Ninth Circuits. Sam also serves as a member in the Idaho Trial Lawyers Association, the Idaho Bar, and the Third and Fourth District bar associations. Sam enjoys spending time with his son, Jack, and his daughter, Jody. Jack is studying chemical engineering at Colorado State University in Fort Collins, Colorado. Jody has enrolled into the nursing program at Eastern Washington University in Cheney, Washington. Idaho State Bar, Idaho Trial Lawyers Association.